In order to fix a damaged tarpaulin, you must have the correct glue for vinyl tarps. Since these devices are made of vinyl, you will utilize the adhesive which will work with the material involved. In order to discover what will work best for your project, there are a few things you should consider. This type of vinyl tarp covering is what many people tend to confuse with polyethylene. The former has a uniform face, which is heavier in weight, and much stronger. The latter is lighter, and crinkles when moved. Polyethylene is also woven, so the differences are not subtle. Those who have dealt with both products realize the deviations. When dealing with the harsh elements, you want a device which will protect so much as possible. With that being written, this type of compound is a bonding of two, or more, monomers which form a polymer. When this occurs, in a laboratory, this plastic occurs. Please realize this does not happen, naturally. It is a univalent synthetic radical CH2CH, which is a derivative of ethylene. Simple, white school cement does not work to mend any damage to this compound. The cement, which will be employed, must cause a "melting" so that the polymer will change composition, and thus, mesh with itself. This repairs what has been destroyed, and the sealing will be permanent. Now, if other tears, or destruction, happen, other mending, with the cement, will have to take place. The adhesive can be solvent based, or what is deemed hot melt paste. The solvent types usually have a curing time, so that permanent adherence will happen. These do cause a loss of thickness, of approximately fifty, to seventy, percent, incidentally. 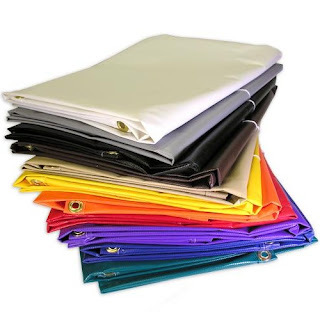 The hot kinds allow for use of the vinyl tarp within a relatively short period of time. They do not cause any lessening of thickness.